When it comes to food, I’m not picky, I just know exactly what I want. Take the humble grilled cheese sandwich for example. It’s a sandwich I adore and yet I would never have one outside my own kitchen. I want the bread to be crisp and toasty all around, but I don’t want it to be smashed in a panini press until it’s cracker thin. 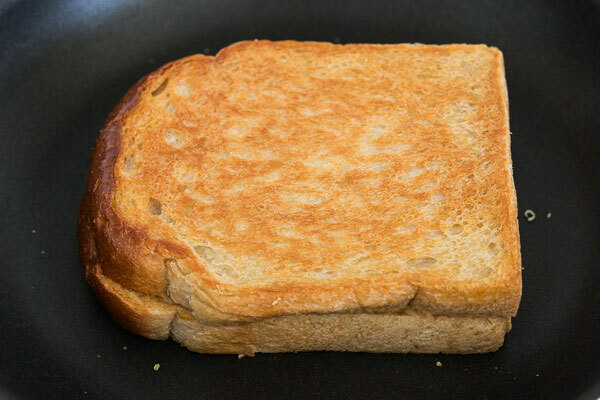 Since it’s called a “grilled cheese” (not grilled bread), I want the sandwich to hold a lot of molten cheese, but I don’t want to bite into a grease balloon that causes me to drool molten fat like an infant. Lastly, I love cheese, but it can quickly become salty and monotonous after a few bites so I want a sandwich with some other tastes to balance out the salt. Demanding yes, picky no. So how do I make mine you ask? The trick to giving your sandwich an even tan is to add some weight on top. This doesn’t mean smashing it between two locking metal plates, turning your bread into a cracker. I use just enough weight to ensure an even contact patch between the heat source (your pan) and the sandwich, so that you have a crisp outer surface with warm fluffy bread underneath. A flat-bottomed plate such as a pie or tart dish works perfectly for this purpose. Unless you’re using sheets of processed American cheese, the grease problem is a little harder to solve. The main issue is that when heat is applied to cheese, it melts, and eventually the milk solids and fat separate. With just a little cheese, the bread will absorb the extra grease, but if you put too much it starts to pool around the cheese. To solve this, I borrowed a trick I use when making fondue. By tossing the cheese with starch, it helps prevent the cheese from separating, thus warding off that dreaded look of hot fat dribbling down your face as you bite into the sandwich. As for the one-dimensionality in the taste department, I do a couple of things. The first is that I like using olive oil instead of butter. A grilled cheese sandwich is never going to be “healthy”, but making it with olive oil instead of butter gets you the wonderful green flavor of olive oil while saving you about 5 grams of saturated fat and 30mg of cholesterol. I also like adding something sweet to my grilled cheese sandwiches, like fruit chutney or caramelized onions. Both will provide a balancing counterpoint to the salty-creamy cheese. Try making this with the tomato soup I wrote about last week. It should only take you about 30 minutes to make both and they’re a great way to survive the last few weeks of winter. 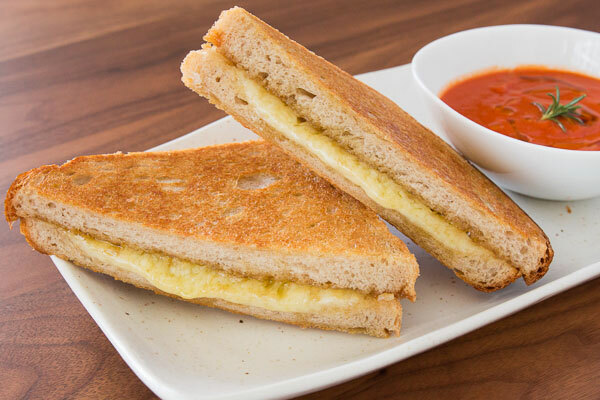 Add mango chutney or caramelized onions to your grilled cheese for extra flavor. 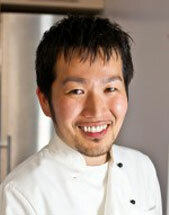 Food blogger Marc Matsumoto shares his tips for making a perfect grilled cheese in a full post on the Fresh Tastes blog. 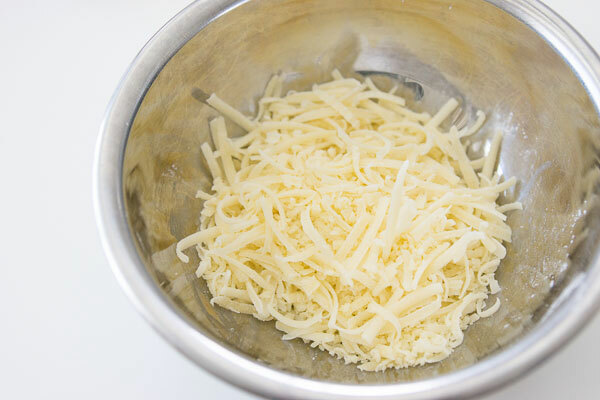 In a small bowl, toss the cheese together with the potato starch. Drizzle half of the olive oil onto one slice of bread. Spread it around with a spoon, and then put the bread, oiled side down, in a skillet. Top the bread with the shredded cheese, being careful not to spill too much onto the pan. On your other slice of bread, spread the mango chutney onto one side. Place the bread, chutney-side down, onto the cheese. Drizzle the remaining olive oil onto the top of the sandwich, and spread it around with a spoon. 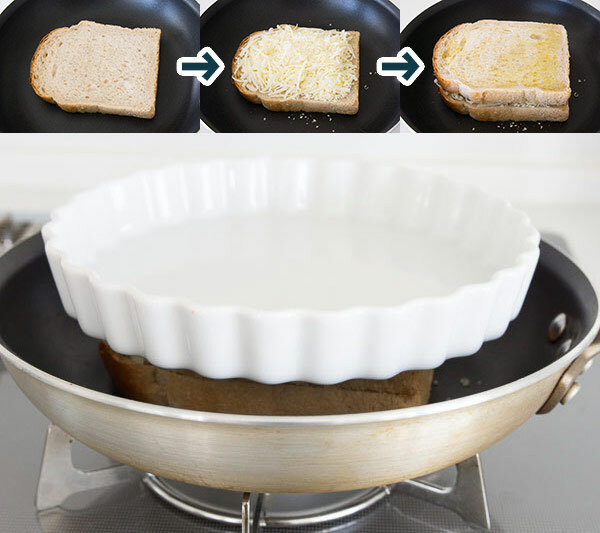 Place a flat-bottomed plate on top of the sandwich, then put the skillet on the stove over medium low heat. This grilled cheese recipe pairs well with our creamy tomato soup recipe for a belly-warming meal.